Muskie fishing is a very rewarding experience. 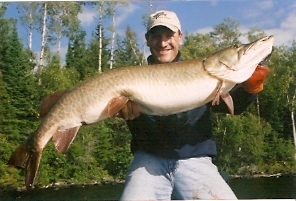 Muskie are a very tough and demanding fish, so be patient when hooking and landing a Muskie. Please take care not to damage a Muskie when catching and releasing so future fisherman can enjoy the experience of catching them also. When taking a picture, do so quickly so you can get the fish back in the water. 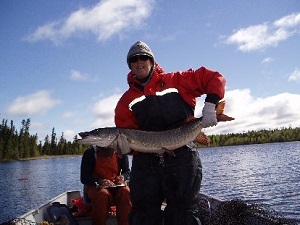 We prefer you hire a guide for your Muskie fishing, this increases your chance of catching one and insures that they are not over fished, allowing them to thrive in the natural habitat and making future trips more enjoyable for everyone. 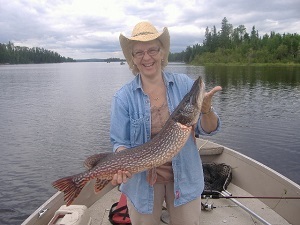 We have Tiger, Spotted, Barred and Clear Strain Muskies at Stork Lake Lodge. We recommend a heavy action rod and heavy duty reel with no less than 60# no stretch super line. 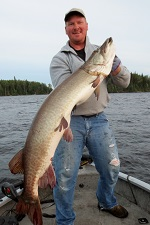 During your stay at Stork Lake Lodge you can enjoy Muskie fishing. Muskies are strictly C.P.R. (Catch, Picture, and Release) No Exceptions. 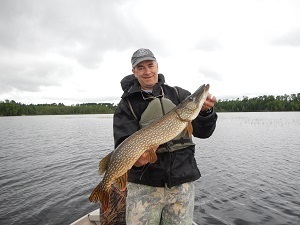 Northern Pike fishing is very similar to Muskie fishing, so be patient when hooking and landing a Pike. Please take care when catching and releasing a Pike so future fisherman can enjoy the experience of catching them. Don't forget to take a picture. We recommend a heavy action rod and heavy duty reel with no less than 30# no stretch super line. 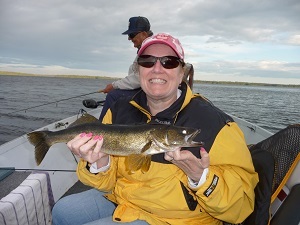 Walleye fishing is a lot of fun and one of the best tasting fish. They are fast paced and tons of enjoyment which will keep kids and adults busy. We recommend a light to medium action rod and medium duty reel with 6# to 8# monofilament line. 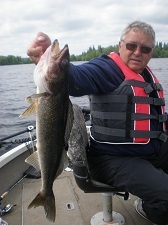 We do not allow any walleye over 18” to be kept. We have live minnows on hand at all times. 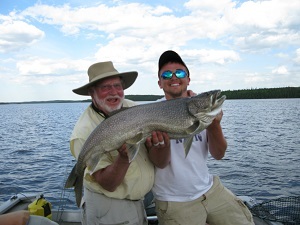 Lake Trout are in deeper waters making them quite a challenge. They are a very strong fighter so hold onto your rod when reeling one in because you might be there for a while. We recommend a heavy action rod with a heavy duty reel with 30# fireline for trolling and 8-10 lb mono for jigging. Please bring your own Personal Floatation Device (Life Jacket). It's the LAW! We provide cleaning and packaging of your fish for your trip home at no charge.